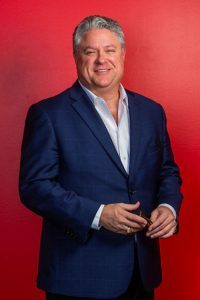 Hallaron Advertising Agency was honored with a 2017 ADDY from the American Advertising Federation (AAF) earlier this year at the annual gala held in Houston. 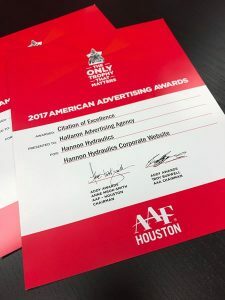 Hallaron’s accolade this year includes a Citation of Excellence for a corporate website produced on behalf of client Hannon Hydraulics of Dallas and Houston. Credit for the work goes to Project Manager Todd Wold and Web Designer Carla Garza, as well as, Lana Matsuyama, Diana Simonetta, Shane Doerring, Megan McDonnell and Anica Arena. Citation of Excellence – B2B Website. Corporate Website for Hannon Hydraulics. Hannon Hydraulics is known worldwide as one of the leading hydraulics equipment companies for custom manufacturing, industrial equipment repair, replacement parts and field service. Their work expands across industries with a focus in offshore exploration and production, steel mills, and heavy construction and mining. Hannon Hydraulics was founded by Wade Reed in 1976 and has offices in Houston and Dallas.